The original plan was to go to Take Sushi however, when you were browsing their menu, you noticed that that it actually comes from the Nami website! I guess they are somehow related. Maybe the same owner? That peaked my interest to check out Nami. 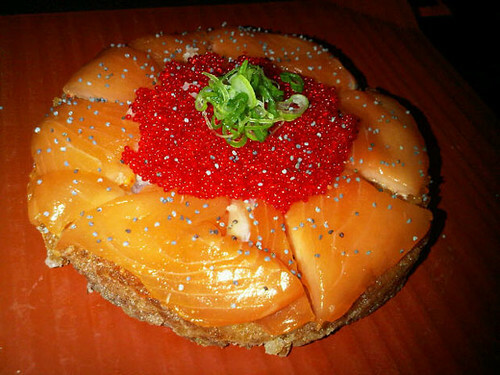 The first thing that I noticed after some googling is that someone on Yelp said that they are the originators of the sushi pizza! The decision to go here instead was pretty easy after that bold claim. Yes, the sushi pizza. Pretty much the only consistent thing we eat at each Toronto sushi establishment we visit. So, I walked into NAMI and was expecting it to be a little more high end than it was. The booths, however, look quite nice. They were all reserved, however. Service was prompt and I ordered up a ‘large’ Sapporo. I thought it was a bit weird that all the booths were “reserved”, even a little suspect as we were seated in the main central area under the “spotlights”. The booths and the rest of the seats did fill up fairly quickly after we arrived though. Looking through the menu, I can see already that it has “higher end” pricing with each dish being $2 – $5 more than other standard sushi restaurants around time. Let’s see if it’s going to be worth extra cost. We ordered the Sushi Spring Roll, Sushi Appetizer, Sushi Pizza (of course! 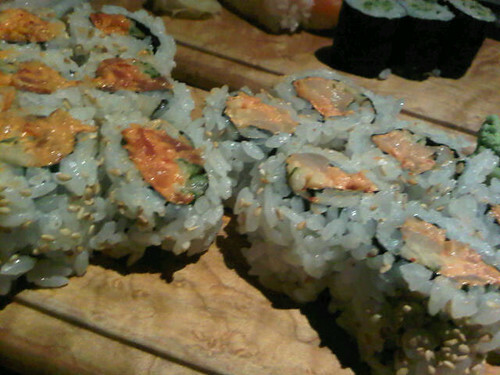 ), Spicy Tuna Rolls, and Spicy Scallop Rolls. The dishes came out pretty fast with the sushi pizza first out. From glancing around seems like a popular order. All I can say is disappointment. I guess I was expecting more out of it. The rice was over fried and there wasn’t anything really special about it. I totally agree. If NAMI is where the sushi pizza was ‘invented’ then it’s the other sushi restaurants that have furthered it to make it a worthy dish. I wouldn’t order the sushi pizza here again. For some reason I thought the Sushi Appetizer would have been bigger but I guess I was wrong. The sushi was decent – no qualms there. The little cucumber rolls that came with it I didn’t even bother with. They should put two decent rolls in there instead of three cucumber rolls. I suppose that’s standard, though. Yup that’s pretty much standard for the Sushi Appetizer at most places. Probably not the best dish to share since there’s just not enough especially when 3 of them are the cucumber rolls. It’s too bad that they didn’t have any small sushi platter or combo available. The next dish was the spicy tuna and spicy scallop rolls which came out together. I must admit, I’ve never had the spicy scallop rolls before. Good pick and will definitely try again at our next sushi stops. These spicy rolls tasted pretty good and are on the spicier side of the spectrum. Yeah, agreed on the lack of selection in terms of sizes. There weren’t really any combo type options available. 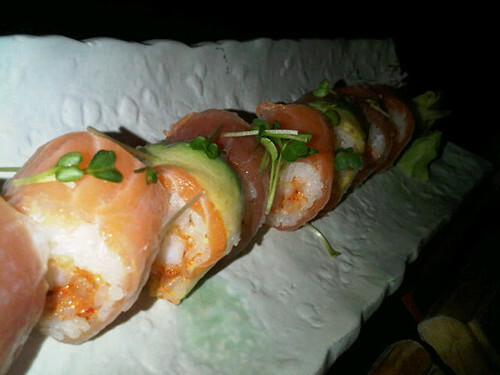 Agreed also on the spicy tuna and spicy scallop rolls – they were decent—and spicy! (sounds weird that I would say that but we’ve been to other sushi restaurants where the spicy rolls aren’t really spicy?!). The final item, then, is the Sushi Spring Roll. It was ‘alright’ – not amazing, but not bad. Service was quick and courteous – can’t complain there. The Sushi Spring Roll was probably the best out of the bunch for me. Yes the service was pretty good. I also noticed that the place really started to fill up by 7 pm or so. Once that started happening, you really feel the tight squeeze as the tables are very close to each other. You are basically sitting beside each other. Again, recommendation is to reserve a booth if you want a little bit of privacy. Yeah, it has that ‘Spring Rolls’ (restaurant) feel—Everyone eats on top of each other there as well. 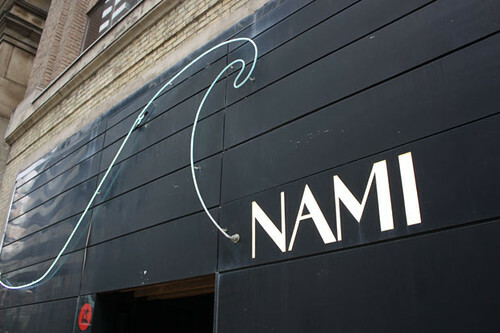 Well, NAMI seems to be named quite often as one of the better sushi restaurants in Toronto – and the outside gives that aura. The prices do as well. 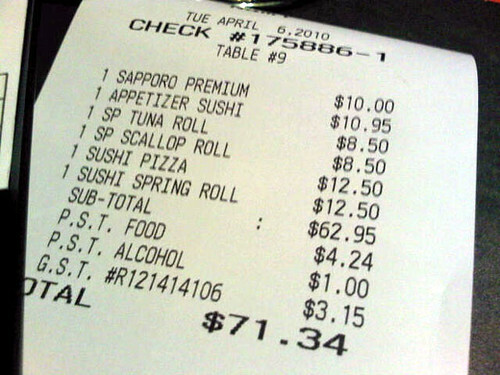 But does the sushi stand up to all of this? I’ll say no. If you’re going to pay more you expect more, and NAMI doesn’t have anything ‘more’ in my opinion. There’s really nothing special about it. Is the inside that much better? I’ve been to better. Is the service that much better? Not really. Is the selection better? No. Is the food that much better? Definitely not. I’ll end my rant by giving NAMI a 6/10. Wow tell us how you really feel…In the end I think Nami is more style than substance. It’s overrated in the sense that the decor and the look of the place doesn’t justify the added price. 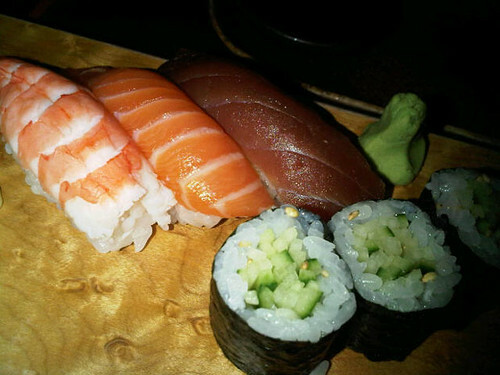 You could find many other sushi restaurants with much better tasting sushi and sushi rolls for much less. A very important thing to note is that the mens bathroom walls are either too thin or too close to the sushi/grill bar. You can clearly hear the conversations word for word from the other customers (Man says “I am starving.” Woman responds with “Yes me too. Wonder what we should order?”) which is actually kind of hilarious. Anyways, 6.5 / 10 for me.